Abstract: Even before the word "laser" came into existence, the maser was shown to be a quantum heat engine (Scovli, Phys. Rev. Lett., 1959). The laser became the darling of non-equilibrium statistical physicists (Haken, Synergetics, 1983) in the 60s and 70s. But the lasers of that era were found to be limited: Multi-mode lasers were essentially uncontrollable. Single-mode lasers were stable, low-noise, highly coherent, very predictable, thus boring in their own dynamics, but also excellent scientific tools. So, the emerging laser community focussed on engineering them to be even better (and more boring) tools. Mode-locking, whereby thousands of modes in a laser cavity are locked to each other in phase, was developed in the 80s and 90s. Mode-locking needs nonlinearity, but it had to be just enough, no more, lest it destabilized the lasers, so the focus became to reduce the nonlinearity one way or another, while increasing lasers's power. Slowly, the earliest picture of lasers as dissipative self-organized states linking non-equilibrium thermodynamics to nonlinear dynamics faded. 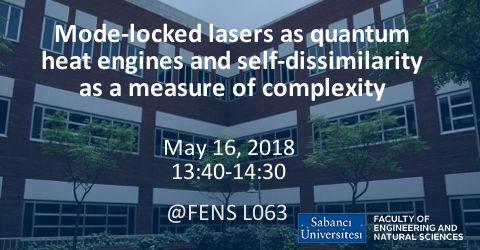 This talk will argue that modern mode-locked lasers, in particular fiber lasers, can link far-from-equilibrium statistical physics to complex systems exhibiting emergence. In addition to experimentally demonstrating signature features such as amplified fluctuations and noise-induced transitions, I will show how we design and construct self-organized steady states through analogies to classical heat engines. I will then introduce the concept of self-dissimilarity of the phase space as a measure of complexity and use it to predict robustness against perturbations. I will conclude with strong conceptual analogies to laser-driven self-organizing and self-assembly, to be introduced by Serim Ilday's talk on Thursday. Bio: Dr. F. Ömer Ilday received the BS degree in theoretical physics from Boğaziçi University, Istanbul, Turkey, in 1998. He took his PhD in applied physics from Cornell University, Ithaca, NY, USA, in 2003. He worked in the Department of Electrical Engineering at Massachusetts Institute of Technology (MIT) from 2003 to 2006. In 2006, he joined Bilkent University as faculty member. Dr. Ilday was the first to propose to manage nonlinear dynamics of mode-locked lasers in order to improve their performance (J. Opt. Soc. Am. B, 2002). This vision led to his invention of the similariton laser, the first laser to operate better with stronger nonlinear effects (Phys. Rev. Lett., 2004). In 2010, he invented the soliton-similariton laser (Nature Photon., 2010). Applying a similar approach to laser-material interactions, he developed Nonlinear Laser Lithography (Nature Photon., 2013), which was extended to 3D volume structures (Nature Photon., 2017) and invented ablation-cooled laser-material removal (Nature, 2016). Based on the original concept, he was awarded the European Research Council’s prestigious Consolidator Grant in 2013, the first of its kind in Turkey. Dr. Ilday graduated valedictorian of the top-ranked Physics Department at Bogazici University in 1998. In 2003, he received the prestigious RLE Fellowship from MIT. His contributions to science have been generously recognized through various awards. In 2004, he received the Findlay Award from Cornell University. In 2006, he received the Outstanding Young Scientist Award from the Turkish Academy of Sciences (TÜBA-GEBIP). In 2011, he received the Teşvik Award from the Scientific and Technological Research Council of Turkey (TÜBİTAK). In 2012, he received the Engin Arık Science Award from the Turkish Physical Society. In 2017, he received the top award in science in Turkey, the Science Award of TÜBİTAK. He is a full member of the Science Academy of Turkey and a senior member of the Optical Society of America. He has served or continues to serve as editor for Optics Letters, Optics Express, Optical Fiber Technology and the Springer Briefs in Nanoscience and Nanotechnology, in addition to technical committees of numerous conferences.